Inspired by Japanese bento boxes, the Box Appetit has an inner dish so you can keep foods separate and a removable sauce pot for condiments and dressing. The glass-like lid has a recessed dipping area—perfect for wasabi or soy sauce. 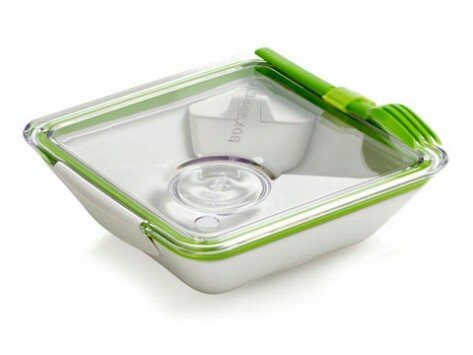 It also has an ingenious locking mechanism that creates a watertight seal so your lunch won’t leak. Dimensions: 7.4" x 7.4" x 2.2"
I ordered this one from the Grommet.I'm really like it and more convenient for my lunch at work. I love, love this dish!! It makes lunchtime so fun! Utilitarian yet so beautiful! Makes lunch delightfully pleasing. My singlular motivation to packing a lunch. Very unique and handy for lunch! Some things aren’t meant to mingle until just the right moment. Stir your yogurt and granola together prematurely, and you’ll wind up with mushy, swollen oats when you sit down to eat breakfast. Add dressing to greens too soon, and your salad is wilted come lunchtime. 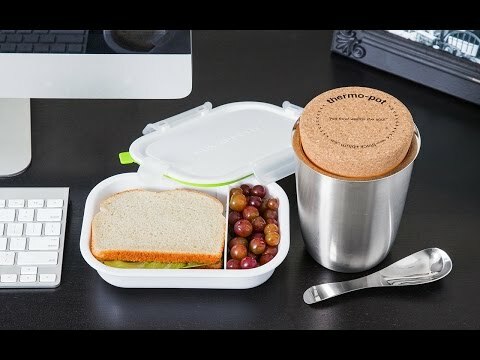 But that won’t happen with black + blum’s new lunch containers, which elevate the common lunchbox to stylish new heights. Inspired by Japanese bento boxes, the Box Appetit has an inner dish so you can keep foods separate and a removable sauce pot for condiments and dressing. The glass-like lid has a recessed dipping area—perfect for wasabi or soy sauce. It also has an ingenious locking mechanism that creates a watertight seal so your lunch won’t leak. For soups, the Thermo Pot is one-piece pot with a magnetic spoon and a cork lid. The creators are Dan Black and Martin Blum, who founded the black + blum studio in London. The two designers have a reputation for creating modern products that are innovative, practical, and charming—the recipe for a perfect lunch.